The colourful harbour town of Tobermory could have been designed especially for artists. Together with the famous painted seafront houses, there are fishing boats, a stone-built fishermens' pier, an iconic clock tower, anchors, skyscapes, and many interesting buildings and objects to inspire both sketches and larger-scale works. Your host and tutor, Tim Barnard, trained as a technical illustrator in Southampton and Swansea and has worked as a freelance illustrator since 1987. Tim was retouching photos by hand before photoshop was invented so is especially skilled in mixing the perfect colour. If sky-blue pink is what you want, he can show you how to make it! Technical illustrators have to be very accurate in what they draw so if you're perplexed by perspective or baffled by boats, he's the ideal person to ask. Tim will help you learn and improve your sketching skills using pencil and watercolours. A field watercolour set and sketchbook are included in the price and you will have the chance, if you wish, to experiment with watercolour pencils and other media. Should you fall in love with these, they are available locally and we have negotiated a special discount for our painting holiday guests. A Tobermory Painting Holiday is not an art class. Tim works with you in the same way as a music tutor does, starting at your current level then building your skills and technique to help you achieve your aims. You will be creating pictures from the start, whether you've been painting for many years or never picked up a paintbrush before. The emphasis is on enjoyment and achievement. Rather than spending the week working on a big painting, you will learn the art of sketching with pencil and paint so that wherever you are you will be able to use your pocket-sized painting kit to record what you see at any time. You will go home with something special to remember your holiday by - and, we hope, increased skill and confidence in your artistic abilities. A typical day begins with one of Sheila's delicious breakfasts before tuition begins at 10 am. Working outdoors if the weather permits, indoors if it's raining, you will be able to a large extent to choose your subject. You will hone your sketching skills and learn how to get the essence of the scene in front of you onto paper. 'Elevenses', with tea/coffee and Sheila's home-baking, will be provided. After the morning session, you will have time to enjoy a leisurely lunch in whatever café takes your fancy or perhaps sit on the seafront with something tasty from the Tobermory Bakery. The afternoon session consolidates the morning's work and throughout the day Tim will show you techniques and tricks to help you achieve the result you're aiming for. With a small group of two to six people, you will have plenty of individual tuition. The afternoon ends at 4 pm so there's plenty of time to get ready for your evening out. 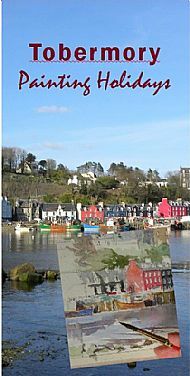 Tobermory has an excellent range of restaurants with dishes and prices to suit everyone. Wednesday is a day off for you to explore the island at your own pace or perhaps to take a wildlife trip by sea or land. There are some lovely walks right from our doorstep. We have been offering B & B at Viewmount for over 20 years. It's very much a family home rather than a guest house. There are no TVs or en-suite bathrooms but there are lots of books, lovely views, peace and quiet, a wood-burning range for heating and solar panels to supplement the electricity. Breakfasts are locally-sourced wherever possible and include honey from our bees and home- made jams and marmalade. Accommodation is in twin rooms (ideal if you are travelling with a friend or companion) or single rooms. If you're travelling with a non-painting companion, they stay at our usual B & B rate. There is plenty to do for anyone not here for the painting: sea, river and loch fishing, walking, wildlife tours, photography, ornithology, whale watching, “puffin therapy”, Fingal's Cave, Iona, museums, sea aquarium, distillery, castles, art & craft galleries, golf courses, and a swimming pool with spa and gym. You are welcome to extend your stay at either end of the painting holiday at our usual B & B rates.